#WalangPasok | November 13, 14 and 15 declared special non-working days in Metro Manila, Bulacan and Pampanga for ASEAN Summit - Balita Boss! 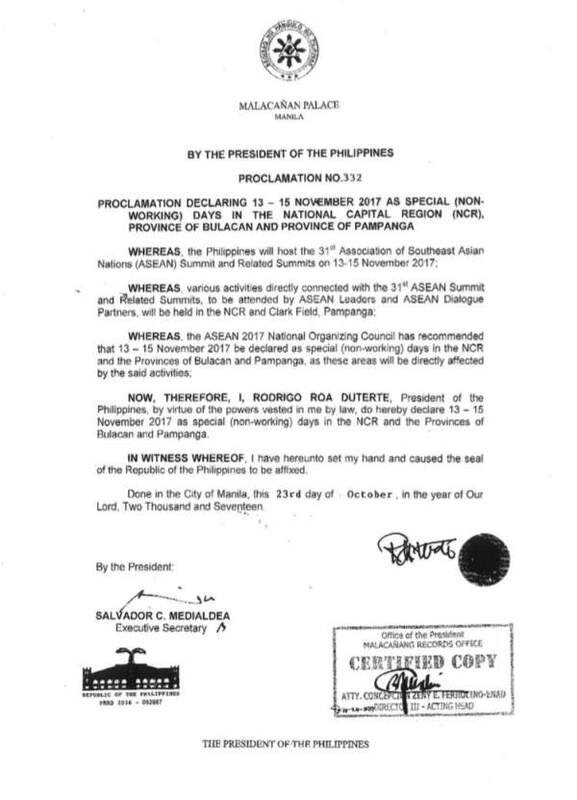 Malacañang has declared November 13, 14 and 15, 2017 as special non-working days in Metro Manila, Bulacan and Pampanga for the 31st Association of Southeast Asian Nations (ASEAN) Summit and Related Meetings. The declaration was made on Monday, October 23, through Proclamation No. 332, signed by Executive Secretary Salvador Medialdea. "Various activities directly connected with the 31st ASEAN Summit and Related Summits, to be attended by ASEAN Leaders and ASEAN Dialogue Partners, will be held in NCR and Clark Field, Pampanga," the proclamation reads. The proclamation was done upon the recommendation of the ASEAN 2017 National Organizing Council. The events in the 31st ASEAN Summit and Related Meetings will be held from November 10 to 14 in Clark, Pampanga and the Philippine International Convention Center (PICC) in Pasay City. The ASEAN summit is expected to gather top officials of Southeast Asia and its partner countries, including US President Donald Trump.